Okay, so just a few things I want to cover before we jump into symphony. This really sets the framework for using symphony, because the way that we grab symphony components and the way that drupal grabs symphony components is through the same process with composer. 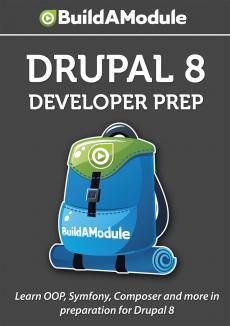 Now when you download drupal-8 it will already have all of these packages installed. You don't have to run composer in order to build up drupal-8. But if you look at the drupal code, let's jump back to the file browser and let's jump up to our drupal folder. You'll see this composer. json file here. If we open it you'll see a json file that's a bit more complex than the one we've been using, but you'll at least recognize require here. In this list even is doctrine/common which includes our inflector library.